One of the most heard lines at the end of a work out is “Stretch and don’t forget your protein.” Pursuit Training coaches will remind you that it’s super important for your recovery to get protein into your system within 45 minutes post workout. The trouble is, there are so many different forms and types of protein, it can be challenging to figure out what is best. Not unlike most foods, there are a few different criteria that you need to look at when choosing your protein. Paramount is will my digestive tract accept it? This covers food allergies, sensitivities and the quality of the protein. Next, is it giving me a lot of what I need and as little as possible of what I don’t, like sugar, sweeteners and preservatives. Lastly, how does it taste? Weighing between, can I choke that down to it this too dangerously delicious to have around? 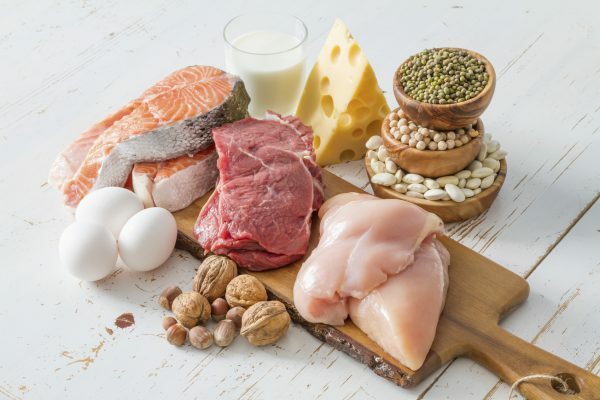 Here are some facts about the proteins that are generally and readily available. Whole Food – In a perfect world we would all be able to go home and sit down to a fantastic high protein meal. This meal might include beef, chicken or fish or eggs alongside spinach (think Popeye), kale, broccoli or brussel sprouts. Other great proteins include edamame, quinoa, cottage cheese or greek yogurt. But we all know that this is not necessarily possible at every meal, especially when we are on the run to and from the gym. Protein Powder – There are many different brands of protein powder on the market. The most important characteristic is the quality, where does it originate, how is it processed and you want to make sure you are getting a minimum of 20 grams of protein per serving. Below is a list of the types of protein powders and where and why you might use them. Whey – Whey protein is a dairy based product created from the watery portion of milk that separates from the curds when making cheese. Also known as whey isolate. Whey is a fast absorbing protein that is often suggested for a post-workout recovery drink. Pea – A vegan protein made from yellow split peas, for those who are looking for a protein without meat, dairy, or gluten. The newest protein on the market, it can be now found nearly everywhere. But one caution, pea protein doesn’t contain essential fatty acids like seafood and nuts. Casein – Also know as simply milk protein, casein is created by dehydrating milk in a lab. Casein, the other dairy protein is absorbed at a much slower rate than whey. The best times for casein supplement is at bed time or when you have a long time between meals. Soy – Soy protein is derived from the soybean that has been dehulled and defatted. There has been bad press surrounding soy due to the phytoestrogens found in it. In our bodies phytoestrogens mimic estrogen causing concern for people who do not want to increase the effects of estrogen in their system. Others – The above are the four most popular and readily available protein powders, there is also Hemp, Brown Rice, Egg and Plant-Mixed Proteins. What about when you can’t get in a whole food meal and don’t like to take your protein in a liquid form? What else can you do to make sure that you are getting the protein that you need post workout and throughout the day? Understanding that whole foods and protein shakes may be the top two forms of protein intake, but looking for another option? Protein Bars are very popular and available in every corner store and grocery as well as health food shops. Be careful because not all protein bars are created equal. Often store bought bar are laden with sugar and preservatives. Always look closely at the label and make sure that the protein amount is over 12 grams and the sugar is below 8 grams. Other protein laden snack options include nuts and seeds, the mighty pumpkin seed would surprise you, 19 grams of protein in 100 gram serving!! At Pursuit Training we are always available for fitness and nutrition questions. We use and stock top quality Poliquin Supplements including whey and pea protein powders. Ask your trainer for a sample after your next workout. Coming soon, you will find Pursuit Training Protein Shakes at Frantastic Cafe, 229 Brock St N.